According to the San Jose Mercury News, Clark Kepler has said that “something big” is about to be announced with regard to the Kepler’s story. Lookout for an annoucement soon. 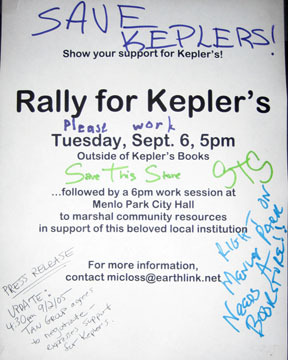 The San Jose Mercury News mentioned Kepler’s in an editorial arguing for an internet tax. The absence of such a tax allows people to buy from online stores such as, ahem, Amazon without contributing to their local economies. Consider the recent closure of Kepler’s, Menlo Park’s storied bookseller: It’s clear that the 8.25 percent price premium that shoppers had to pay when buying books there instead of online didn’t help it stay competitive. A letter to the editor in Friday’s Palo Alto Weekly rightly suggests that Kepler’s should name someone with a purely literary interest to its board of directors. Salman Rushdie’s appearance, originally scheduled for October 3 at Kepler’s, has been moved to Books Inc. in Mountain View on Castro Street. Kepler’s has issued a press release announcing the formation of a Patron’s Circle of local investors and a Board of Directors as part of the efforts to save the store. The story was picked up by the San Jose Mercury and the Palo Alto Weekly among others. Details on membership and volunteer opportunities will be available soon. Kepler’s today announced the formation of a Patron’s Circle of 17 community-minded individuals who will provide the financial basis for the bookstore’s renaissance and a Board of Directors that will add substantial financial and business expertise to Kepler’s while keeping its heart and soul alive. 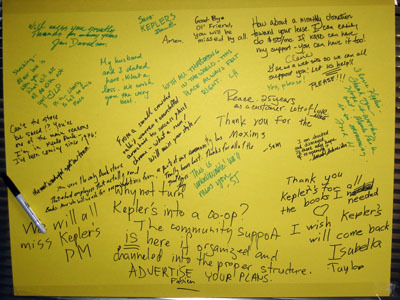 Members of the City Council have pledged strong support for keeping Kepler’s as the hub of downtown Menlo Park. However, the well-known and loved bookstore still faces hurdles in its ongoing negotiations with its landlord, the Tan Group of Palo Alto. Members of the Board include Clark Kepler, President, CEO and Chairman of the Board; Daniel Méndez, a Menlo Park resident and co-founder and CTO of Visto Corporation, a wireless technology firm in Redwood City; Geoff Ralston, an Atherton resident and Chief Product Officer at Yahoo! ; and Bruce Dunlevie, General Partner at Menlo Park-based Benchmark Capital and a seasoned veteran of venture capital with more than 15 years experience in high-tech investing. Additionally, click here to read letters from Ira Ruskin and Joe Simitian to the Tan Group. Thank you to all who attended the rally last week and to those who could not attend but were there in spirit. 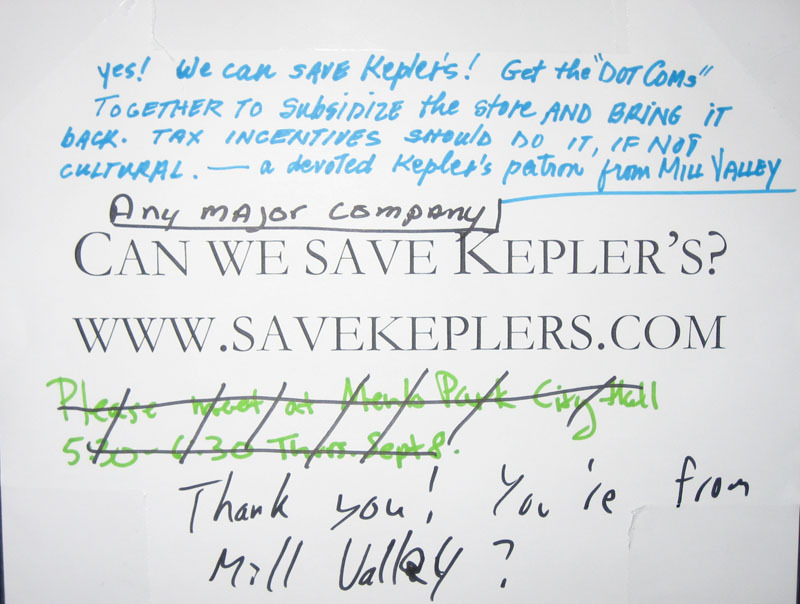 We mentioned writing in through this website as one way to get on the mailing list for saving Kepler’s. Please email us and say Hi if you would like to be on the list. The address for those of you who don’t do email links is savekeplers@gmail.com. (If there are specific ways in which you think you can help–expertise you think you can offer–please note them in your email.) If you have previously emailed in through this site, you are already on our list. 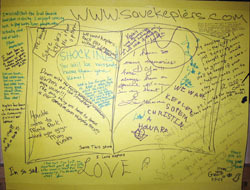 We will keep you informed of any developments in the effort to save Kepler’s. As noted at the rally, if and when Kepler’s returns, there will likely be some sort of membership option available. The benefits of membership will be good and are not to be missed. In the meantime, while we work to restore the store, one thing you can do—in addition to getting on our mailing list and buying local—is to urge the Tan Group, to come to favorable terms with Kepler’s on its lease. Crack your knuckles and start writing letters. 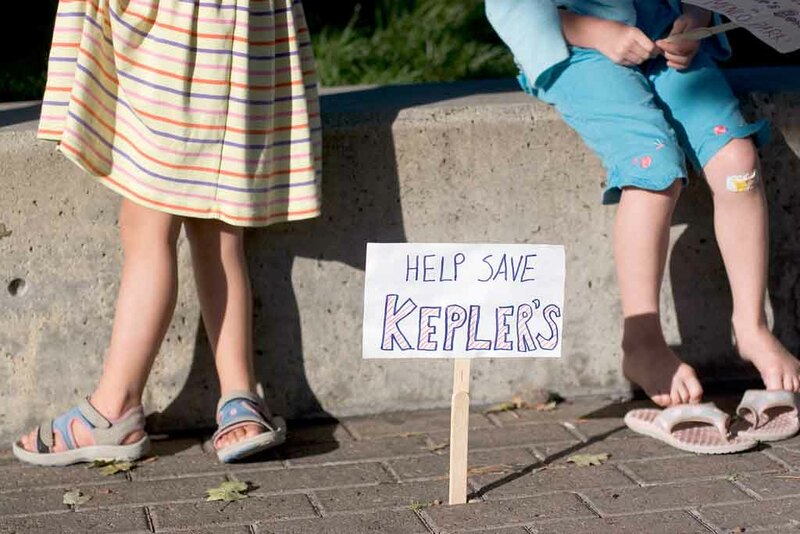 Even a brief message to the group in support of Kepler’s would be helpful. Contact info for the Tan Group: Tan Group: 3630 El Camino Real, Palo Alto, CA 94306, 650.493.6500. They used to have a website, but it curiously went down last week. We persist in wondering why. We are looking for Qualified Investors who are capable of making very large contributions to the effort to revive Kepler’s. If you are interested and think you fit the bill, please email us. 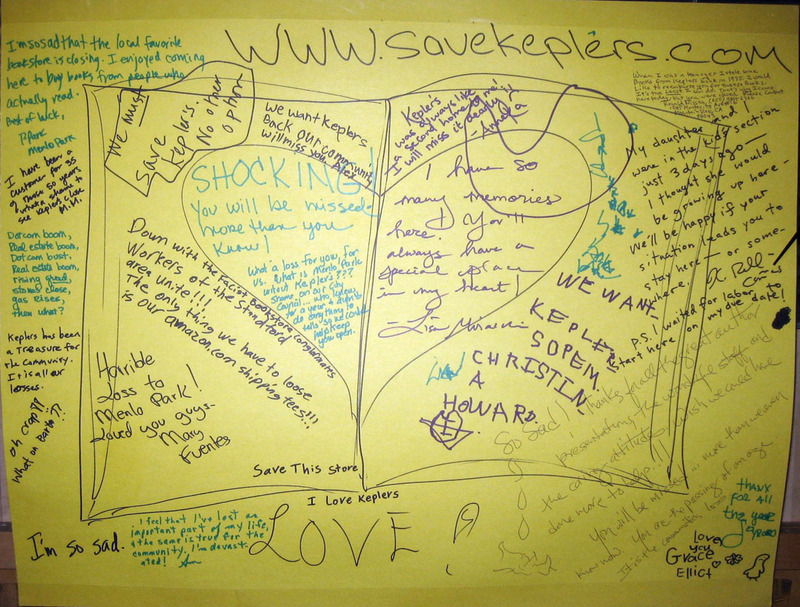 For those who missed them, we have posted some new memories of Kepler’s. The San Jose Mercury ran a short piece updating the current Kepler’s situation. In it, Clark Kepler is quoted as saying, “I don’t think any other attitude than optimism is appropriate. It’s just an incredible outpouring, and I want to do everybody right by making it work.” This one’s optimistic. Click here for the full article. In addition to Sunday’s article in the San Francisco Chronicle, there has been some other media coverage of the Kepler’s story over the past few days. (If you only have time for one story, make it the Chronicle one, though.) David Morrill has an article on Inside Bay Area about the current state of independent bookstores and the resonating effect of Kepler’s closure throughout the bookselling world. Morrill’s article describes a clear opposition between independents and the big chains. Taking a contrarian view, Rhett Butler offers the idea that independent stores could profit by teaming up with Amazon. Gilles d’Aymery argues, rightly, that customers should and will order online, but that they should do so from their local bookstore. If and when Kepler’s reopens, Keplers.com will offer local same day delivery. Not even Amazon can give you that. Also in the news, The San Mateo County Times published an interview with me. If you haven’t written a letter to the Tan Group yet, now is the time to do so. Their cooperation in renegotiating Clark Kepler’s lease on the Menlo Center space is essential if the store is to reopen there. Again, the address for the Tan Group is: Tan Group: 3630 El Camino Real, Palo Alto, CA 94306. Finally, if you are not yet on our mailing list, send us an email. After all, why wallow? Why wait? Update: KQED’s Forum with Michael Krasny did a show about Kepler’s and independent bookstores. Krasny’s guests included Clark Kepler and Andy Ross, the owner of Cody’s books in Berkeley. This show is required listening for people who are concerned about independent bookstores. If you have iTunes, you can click here for Forum’s podcast directory. Otherwise, you can click here. San Francisco Chronicle: The end—or is it? It wasn’t just a bookstore: It was a verb. Strolling through Kepler’s Books in Menlo Park — after dinner or a movie — was once called “keppling” by one die-hard fan of the Menlo Park store. But all keppling ceased on Aug. 31 when the store abruptly closed after a half-century in business. Now there’s a chance that Kepler’s, and “keppling,” may return to Menlo Park, thanks to fans of the store — including a fired-up group of potential investors and a lone ranger who launched an online life raft — who have mobilized to try to reopen its doors. Click here for the full article, which is required reading for anyone interested in saving the Kepler’s. Bookselling This Week has posted an article about the possibility of Kepler’s reopening. 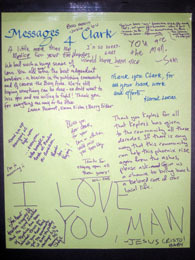 The article cites an email from Clark Kepler in which he says, “I am optimistic that we can reopen.” Likewise, Clark’s note to readers on Keplers.com is now more hopeful than it was last weekend. The group with whom Clark Kepler is engaged in talks to save the bookstore is reportedly seeking Qualified Investors capable of making very large contributions. If you fit the bill or think you can help, please email us for further info. Sunday Evening Note: Posts are not necessarily in chronological order because I am trying to keep more relevant and urgent information near the top of the page. Start scrolling and commence clicking as there is some new content this evening. Rachel Bolten, a Castilleja School senior, said she and her friends would work at Kepler’s for free. Jan Altman, from the company DrivAd, and Richard Cline offered advertising and public relations help. And an 11-year-old Hillview Middle School student said he’d hold a school fundraiser. 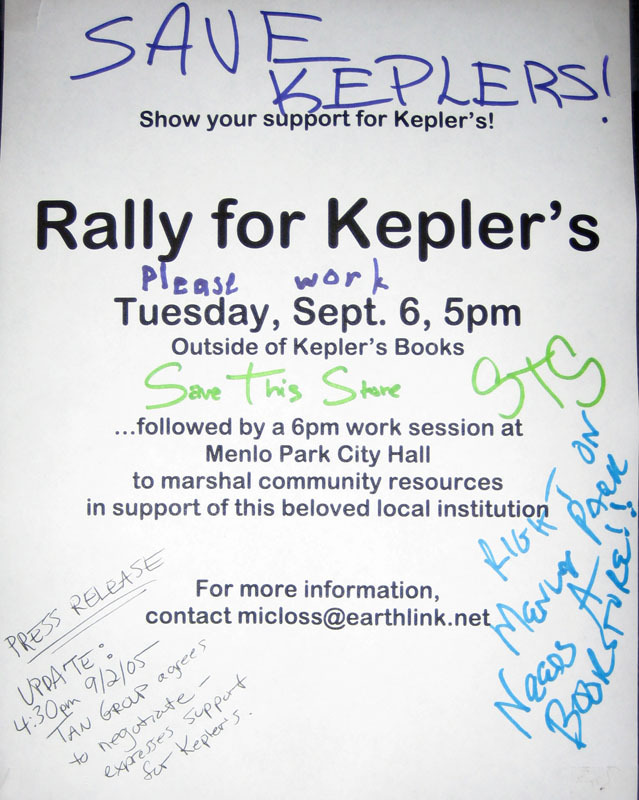 Those were among the numerous grass-roots offers of support for Kepler’s Books — which abruptly closed last week — that were publicly expressed during a special Menlo Park City Council meeting Tuesday. I want to thank everyone on behalf of my brother, Clark, and our family, for the outpouring of affection and support for Kepler’s. I stood in the plaza and remembered the very first store, saw folks from my father’s time, and just cried to hear the kind words spoken. My brother has given everything he could to the store. He has continued our dad’s vision. My dad didn’t just start a store; he started an idea. He wanted to stop war and he needed an occupation that would support his family while he pursued peace. A book lover himself, he decided that selling books — making all ideas available to everyone — was a way to support himself and, oddly enough, he believed that greater knowledge might bring greater peace! Someone said if the store reopens it will, of necessity, be different. Folks, the store has been reinvented many times, more than you imagine. But that is what living things do, they change. Kepler’s isn’t just the building, it’s ideas, community, conversation, learning. I think it morphed from being just a family business years ago and became what the readers, the authors, the detractors and the supporters made of it. First, we have to believe we can change things. Then we will. The local coverage of Tuesday’s rally is starting to roll in. Click on article headlines below for links to full text. First, however, here are a couple photos courtesy of Eric Hegwer Photography. Click on the images for larger versions. 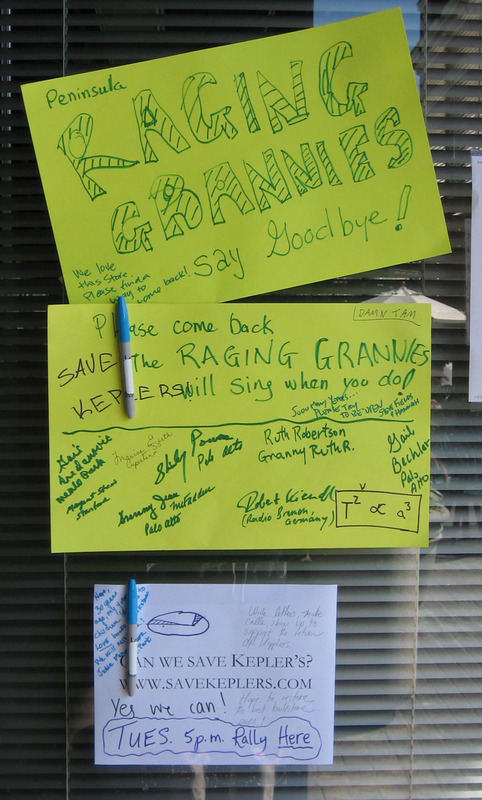 People stepped up at a rally and city council work session Tuesday and pledged their talents, dollars and support to re-open Kepler’s, the beloved corner bookstore in Menlo Park. The crowd was hopeful and hundreds thick at a city-organized rally Tuesday to support keeping their beloved Kepler’s open, this city’s independent bookstore that abruptly closed its doors last week when the money ran out. Hundreds of community members showed support for their favorite independent bookstore Tuesday, rallying in the plaza outside Kepler’s Bookstore and then congregating in City Hall, where the City Council hosted an idea-gathering meeting aimed at saving the store from bankruptcy. Kepler’s closed its doors suddenly last week after 50 years of selling books on the Peninsula. The closure has sparked a wave of support from elected officials, former politicians, lawyers and literary agents, all pledging to help owner Clark Kepler reopen the store at its current El Camino Real location. 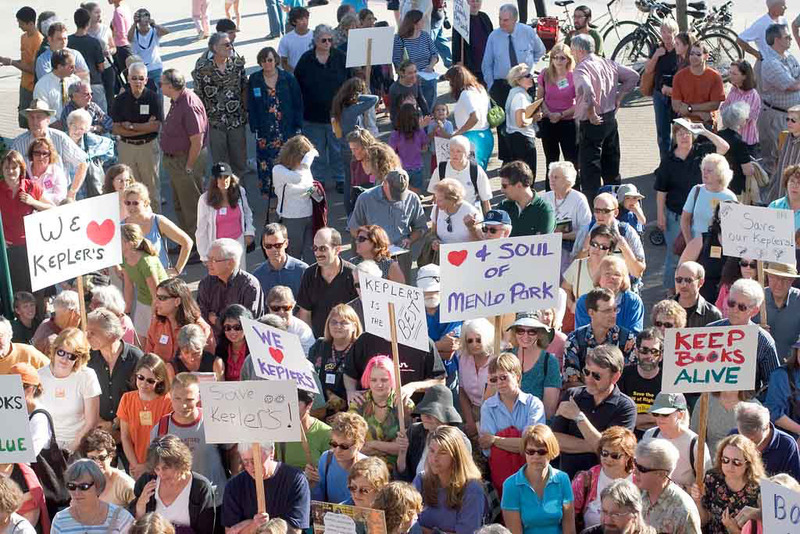 Also, in the San Mateo Daily Journal: Rally to save Kepler’s. Radical Reeves has a post on his blog about the rally and gives a good summary of the meeting afterwards. Here are some photos by MaryLynn on Flickr. Nearly 450 residents of the Menlo Park/Palo Alto area rallied in support of re-opening Kepler’s Bookstore in downtown Menlo Park late Tuesday afternoon — while a steady stream of passing drivers on El Camino Real honked supportive horns. At one point, the crowd was asked how many were Menlo Park residents, and about 30 to 40 percent raised their hands — they were outnumbered by people from other communities. One family — former Menlo Park resident Chris Jacob and her son Alan — had just arrived from Dublin, Ireland, two hours earlier and came straight to the rally to meet her older son, Stephen, of San Jose. Stephen recalled going to Kepler’s at age 3 1/2, and Chris said she still has boxes of children’s books that were purchased at Kepler’s. The sons are now in their 20s. There will be a rally today, Tuesday, September 6, at 5 pm outside the bookstore. The rally will be followed at approximately 6 pm by a work session at Menlo Park City Hall (701 Laurel St., Menlo Park) to marshal community resources in support of this beloved local institution. 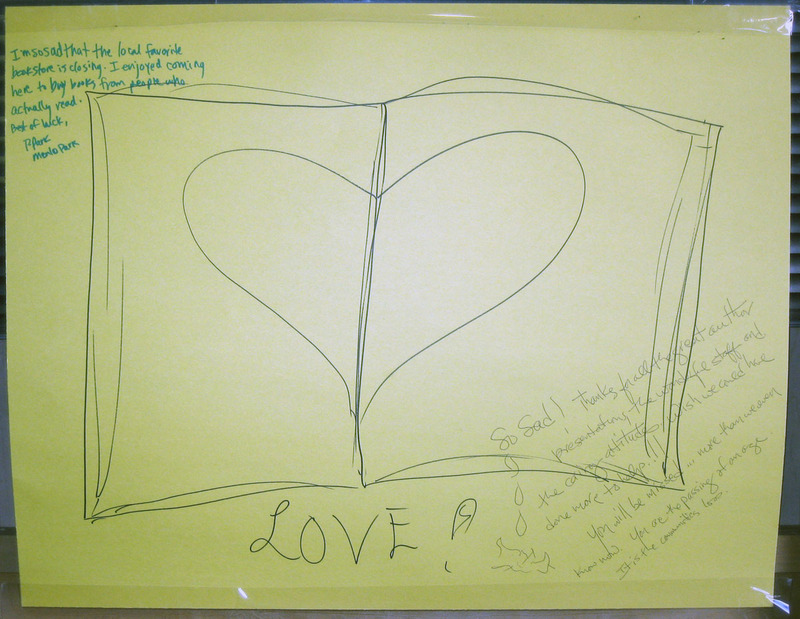 The work session should be attended by all who want to help or learn how to help the bookstore. That goes double for potential investors and those with business, legal, or other expertise that may relate to bookstore operations. People with ideas and suggestions, this is the event for you. People who want to hear ideas and suggestions, this is also the event for you. Clark Kepler will be there. What to bring: Your support for Kepler’s and its owner, Clark Kepler. Perhaps a sign. For more information, click here to download the press release for the event. For even more information, please contact Michael Closson or Rick Opaterny. Here’s the flyer posted at Kepler’s. Click on the image for a larger version. You can also download the flyer and help spread the word by posting it around town. 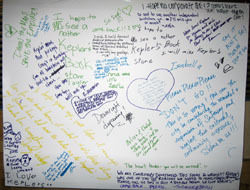 People from all over have been sending in their memories of Kepler’s. Click here to read some of them. Here are some photos from this weekend. Click on images for larger versions. A message to the person who put up the large savekeplers.com sign on the front of the store: Thank you. We give you a big, sloppy hug. The Examiner ran a brief story about the rally scheduled for Tuesday. Bibliophiles throughout the Peninsula are gearing up to try to save Kepler’s Books, a nationally acclaimed bookstore that suddenly announced impending bankruptcy and closure last week. This Tuesday, a rally in support of the 50-year-old bookstore will be held at 5 p.m. in front of its shuttered doors at 1010 El Camino Real. A work session follows at Menlo Park City Hall to discuss plans to save the shop. Those with business, bankruptcy law, real estate, investment and other expertise are especially encouraged to attend. HongDao Nguyen has an article in today’s San Jose Mercury News. 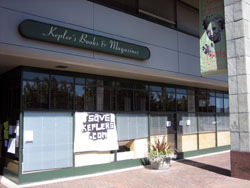 Days after Kepler’s, the landmark bookstore in Menlo Park, shuttered its doors amid financial woes, owner Clark Kepler said Saturday there’s still hope of reviving the business. Kepler said he has received an outpouring of community support since the store’s abrupt closure Wednesday. And the Tan Group, owners of the building that housed the store on El Camino Real, approached Kepler last week to see if they could work something out, he said. Another meeting is scheduled Tuesday. Representatives of the Tan Group could not be reached for comment Saturday. If those talks go well, Kepler said, “I think we have a real good chance of returning.” A handful of potential financial investors have also contacted Kepler to offer help, Kepler said, though he declined to identify them. 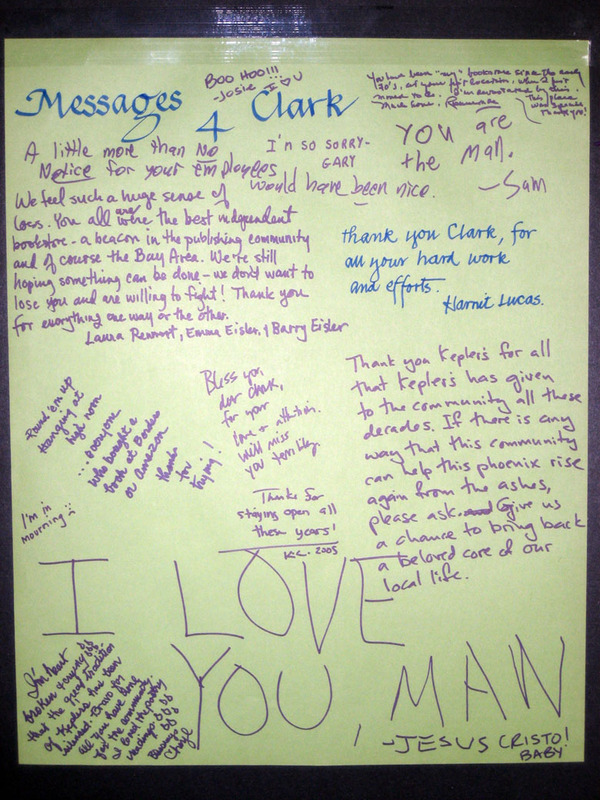 Clark said Saturday that the love he has gotten since Wednesday has been like a “fairy tale.” People have even asked to volunteer their time working at the store, if that would help. 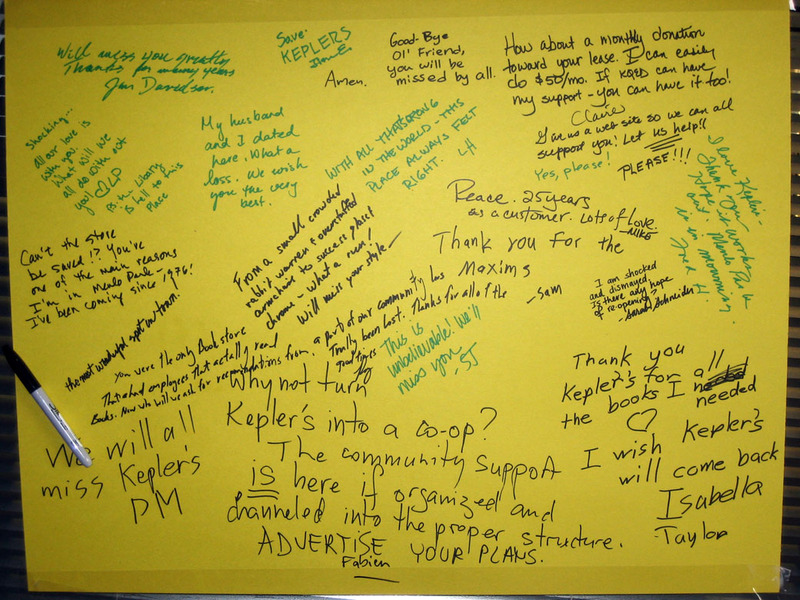 We have all been saddened, even alarmed, by the closing of Kepler’s so soon after we celebrated the store’s 50th. The actual decision to lock the doors was shocking, and apparently a secret closely kept. The closure generated immediate action. Here’s some of what has been happening:. Dave Johnson, the city’s economic manager, has been facilitating meetings between Clark Kepler and his landlord, the Tan group, for several months. These are ongoing. A group of investors has formed. Further financial action will of necessity involve creditors, the terms of the Chapter 7 bankruptcy itself, and the ability to introduce cost-saving and marketing measures that allows an independent bookseller to sustain itself long-term. How to help? Shop Menlo. If there is something that we as citizens can do to make that long-term difference with respect to keeping Kepler’s open, you can be sure I will let you know. And if you have ideas, let me know, please. The reaction of Steven Fields, a longtime customer, was typical on Wednesday. 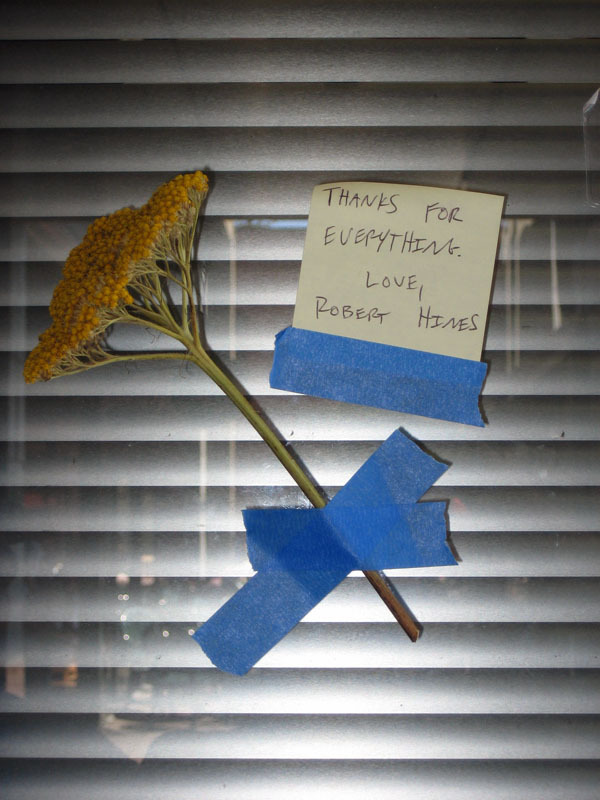 After having lunch at Cafe Borrone next door, he told his 11-year-old daughter, Hanna, that Kepler’s was closed. She immediately burst into tears. The Almanac: Can this bookstore be saved? 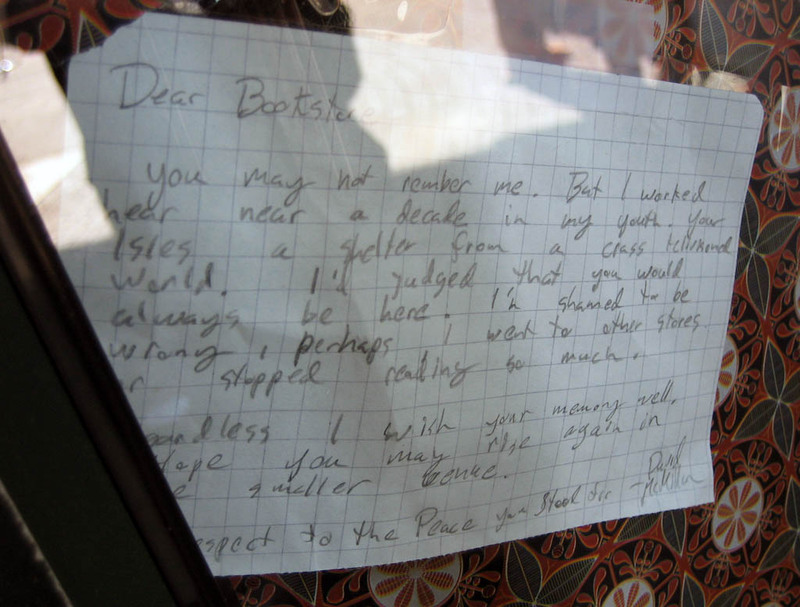 Andrea Gemmet has a story on the Almanac’s site about the possibility of saving the bookstore. 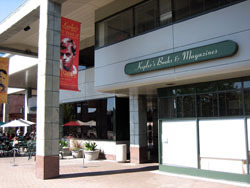 There’s a chance — a chance — that Kepler’s Books & Magazines in downtown Menlo Park may not be as dead as everyone feared. 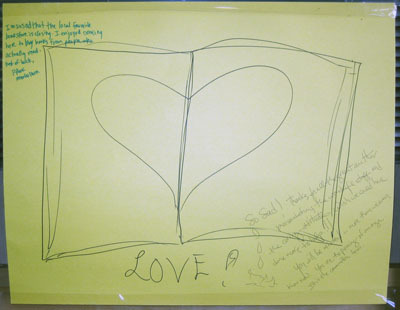 The sudden demise of the popular independent bookstore following Clark Kepler’s short, emotional announcement at a 9 a.m. all-staff meeting held Wednesday, August 31, reverberated up and down the Peninsula, as the store’s many devotees reacted with shock, sorrow and disbelief. 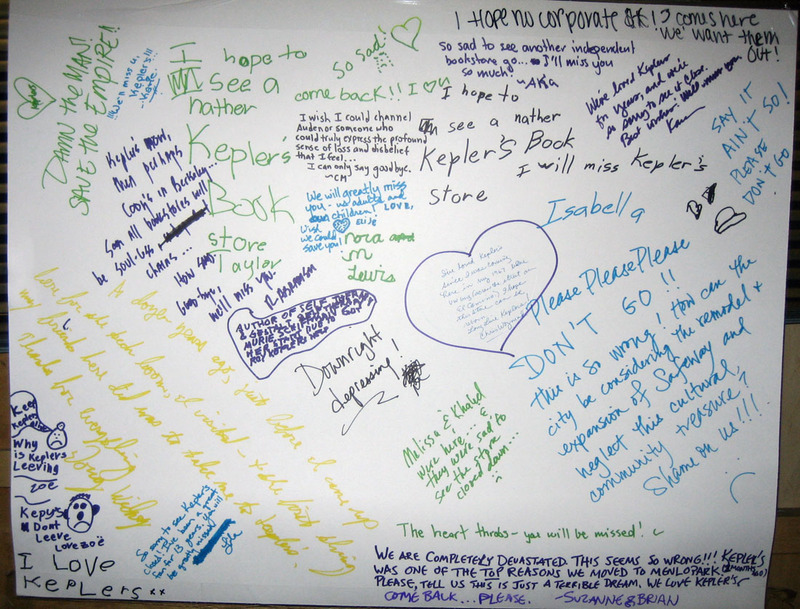 Almost as soon as word got around that the bookstore was shuttered and locked, there was talk of saving Kepler’s. Mr. Kepler said he was still preparing to file for Chapter 7 bankruptcy protection last week, but he had not yet done so. The Almanac/Palo Alto Weekly: A ‘miracle’ ray of hope for Kepler’s? A ray of hope has emerged that Kepler’s Bookstore in Menlo Park could be resurrected. Owner Clark Kepler told the Almanac weekly newspaper (sister paper of the Palo Alto Weekly) Friday that three “qualified investors” have come forward who might help save the 50-year-old store — a Peninsula landmark and cultural hub. “Miracles started happening,” after the investors contacted him, Kepler said in the interview. 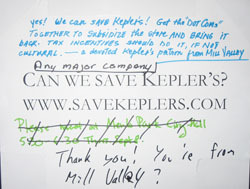 “I’m entertaining qualified investors who are looking at saving Kepler’s.” He declined to name them or give details about the magnitude of the bookstore’s financial troubles. “Daily and hourly, things are happening. Yesterday morning I first started getting these possibilities coming forward,” he said Friday. “I think something is going to happen in the next few days or in the next week that will tell me what direction we’re going in. See the rest of the story on Palo Alto Online. After having spent last night mourning at Borrone’s, I am ready to see what we, the people of the community, might be able to do to save my favorite bookstore. Until we learn more from Clark Kepler about his plans, I’m not sure what, if anything will be possible. However, I am interested in gathering some people who have an interest in preserving the bookstore to discuss what we might do. I have been in touch with people in the bookselling community who know Clark, and hope to have some updates posted here soon. In the meantime, if you are interested in helping, please send me an email so I can add you to the list. Friday Update: As mentioned in the above post, it appears that some potential investors interested in saving the store have surfaced and are in discussions with Clark Kepler. If you have any additional details, please send them in. People have added more messages outside the store. Click on images for larger versions. Here’s what the area near the main entrance to Kepler’s looked like this evening around 7 pm. Click on images for larger versions. Neil Gaiman noted the cancellation of his tour stop at Kepler’s on his blog. Dara, a former Kepler’s employee, in LA encourages us to all support our local independents. Another former longtime employee posts here. 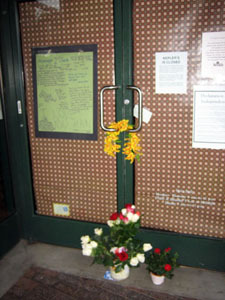 This blogger sighs and compares the closing of Kepler’s to that of Wordsworth in Harvard Square last year. This blogger is in shock, while another is devastated. The Mercury suggested that competition from Amazon killed Kepler’s. Here is a response at Seven Generational Ruminations.